green beans Archives - What the Forks for Dinner? 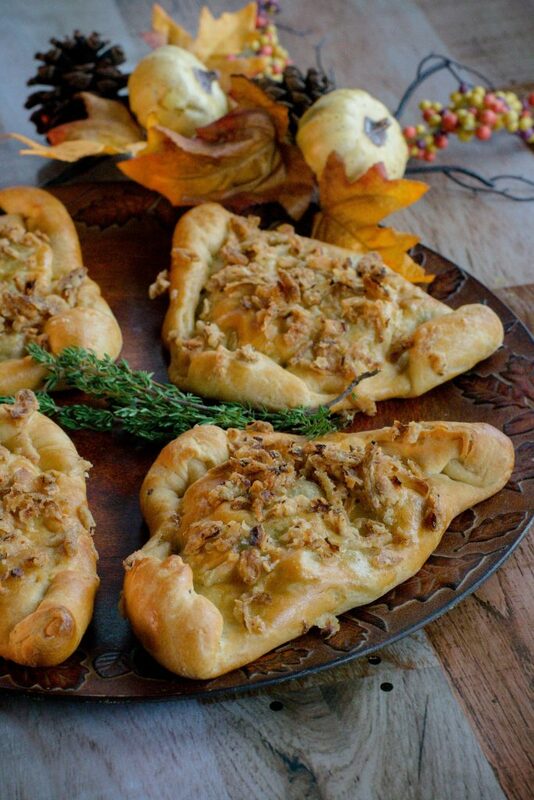 What happens when you combine two Thanksgiving favorites? 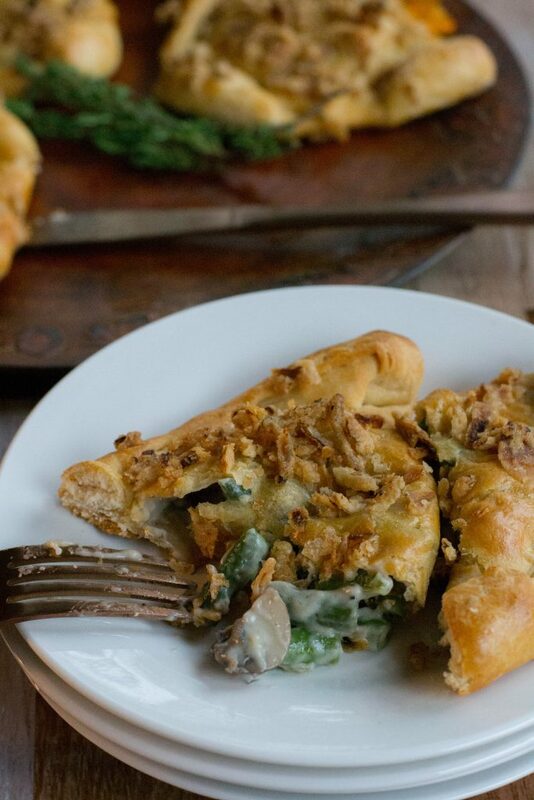 You get Green Bean Casserole Turnovers. Green bean casserole and crescent roll are two Thanksgiving mainstays. Green bean casserole with it creamy sauce, and fried onions, and what not to love about present rolls…..nothing! So, why not combine the two for a yummy turkey day side? In making this recipe I used a from scratch green beans casserole, casserole recipe. No cream of mushroom soup. The beauty of this is that if the cream of mushroom soup is your tradition you can use it easily in this recipe. Thanksgiving was always at my Grandmas tiny little house, that was filled with family and tradition. Crescent rolls being one of those. I loved to help my Grandma in the kitchen and rolling the crescent rolls was my job. 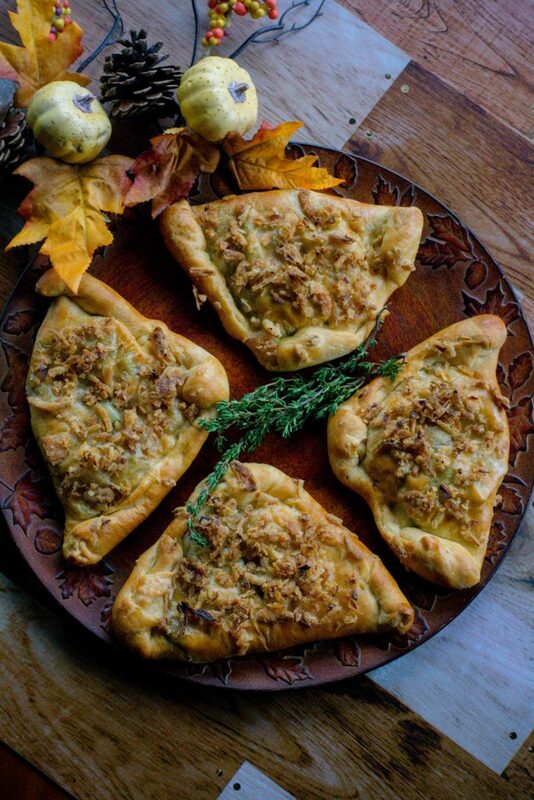 When thinking of traditions and thinking of a ways to combine traditional favorites and Green Bean Casserole Turnovers was a throw back to those bygone days. and check out the new flavors…delicious….the stuff new recipe come from. 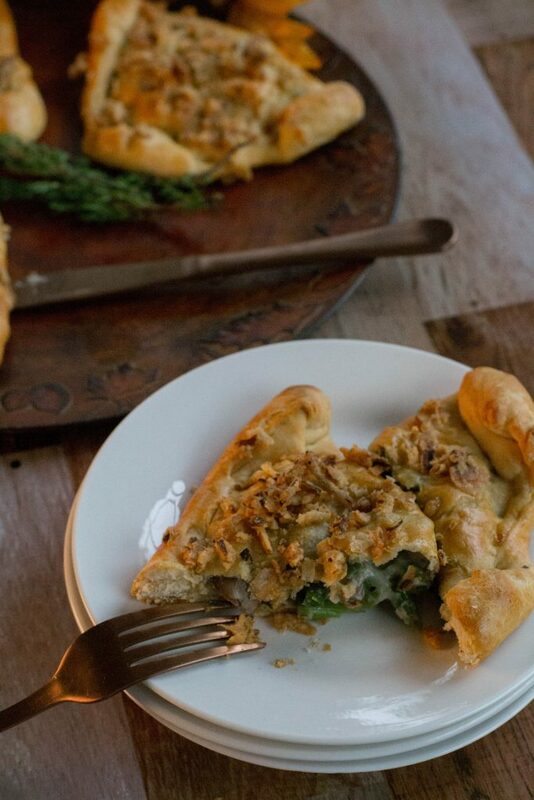 Shake up your holidays this year and try Green Bean Casserole Turnovers and make a new family tradition. Bring a large saucepan of water and 2 tablespoons of salt to a boil. Add the beans and blanch for 3 minutes. 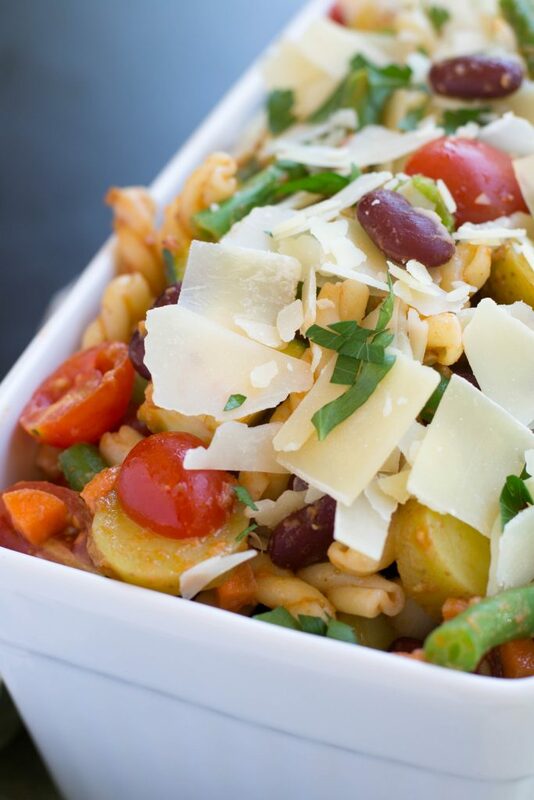 Drain and immediately place beans into a large bowl of ice water to stop the cooking process. Drain beans and set aside. In a large skillet over medium-high heat melt the butter. Add the mushrooms, shallot, salt and pepper and cook, stir occasionally, 4 to 5 minutes. Add the garlic, thyme,and nutmeg and continue to cook for another 1 to 2 minutes. Sprinkle the 3 tablespoons of flour over mushrooms and cook for another minute. Add the broth, stirring constantly for about 1 minute. Reduce heat to medium-low and pour in the half-and-half and continue cooking 6 to 8 minutes until the mixture thickens, stirring occasionally. In a small bowl mix the Fried Onions and butter until mixed well, set aside. While the mixture is cooling unroll the crescent sheets and cut each sheet in quarters, rolling the pieces to make squares. They do not have to be perfect. Place a heaping quarter of a cup of the bean mixture just off center of the square. Fold the dough over the filling to form a turnover. Seal the edges. Repeat with the reaming squares, placing the turnovers on a parchment lined baking sheet. Make an egg wash using 1 egg and 1 tablespoon of water. Brush each turnover with the egg wash and top with the fried onion butter mixture dividing it equally between the turnovers. Bake in preheat 375 degree oven for 12-15 minutes until the crescent are nicely browned. Sometimes in the blog world you need a little help from your friends. 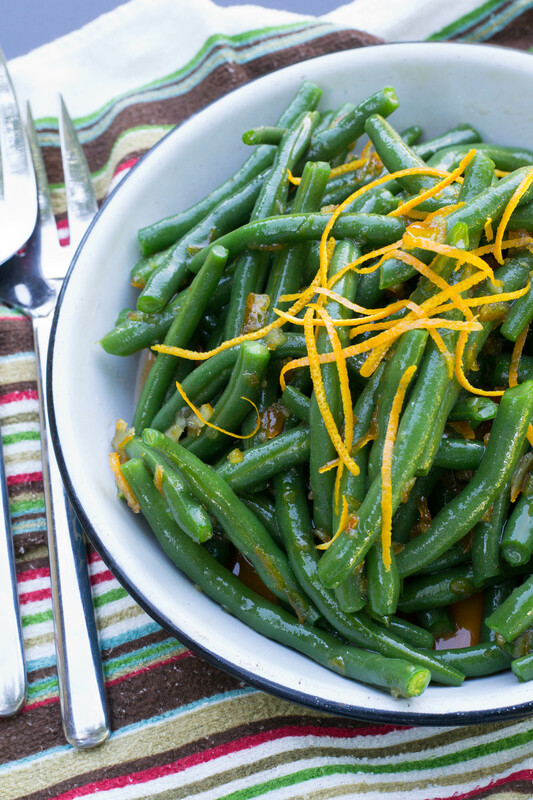 Sriracha Orange Glazed Green Beans was a recipe I found over at Simply Recipes. If you follow me you know I am the Food Service Director for a small town in Northern Illinois. School started this week. Can you say crazy busy?? 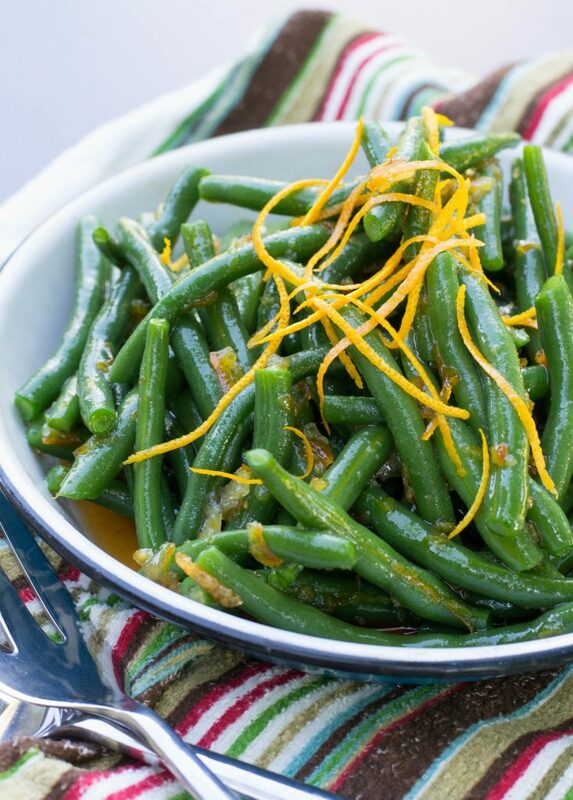 So, I after visit to a local produce cart and purchased some really nice green beans, I needed a recipe. But, with my mind on school lunch, it was hard to focus on anything other than chicken nuggets, and school pizza. I really needed a recipe! My go to Pinterest led me to Sriracha Orange Glazed Green Beans from Simply Recipes. Simply delicious and simply simple. 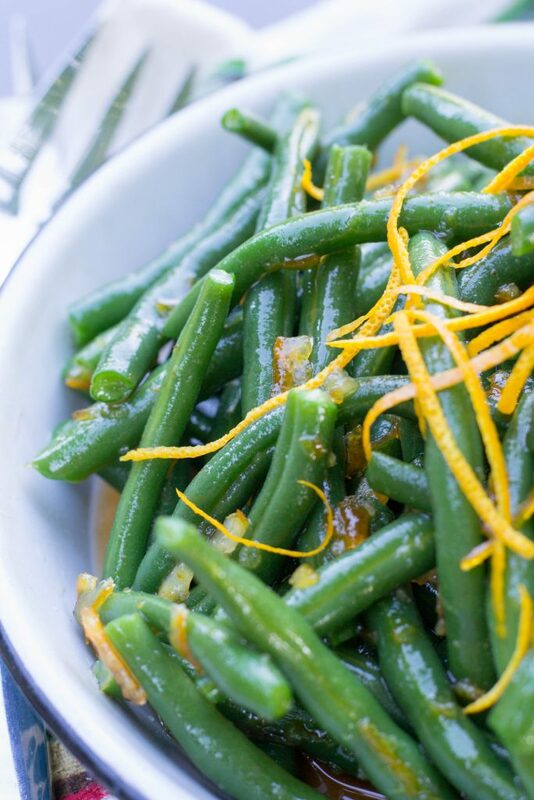 Blanch the green beans, which takes only minutes, once the water boils…..oh hum! Give the cooked beans a quick dip in some icy water to stop the cooking process. This method gives them a beautiful green color, and a crisp snap. In a small bowl the “dressing” is 3 simple ingredients, orange marmalade, soy sauce, and Tim’s favorite Sriracha. Spicy ketchup. It adds a little kick to the recipe. Drain the beans and toss with the sauce……lol, I’m a poet!! Serve at room temperature. They are the perfect side for anything grilled, or would be a nice on a Crudite Platter. Fancy French word for veggie tray. A big thanks to Simply Recipes for giving my over worked blog brain a rest so I could focus on the busy business of feeding the future leaders of the world a nutritious breakfast and lunch! 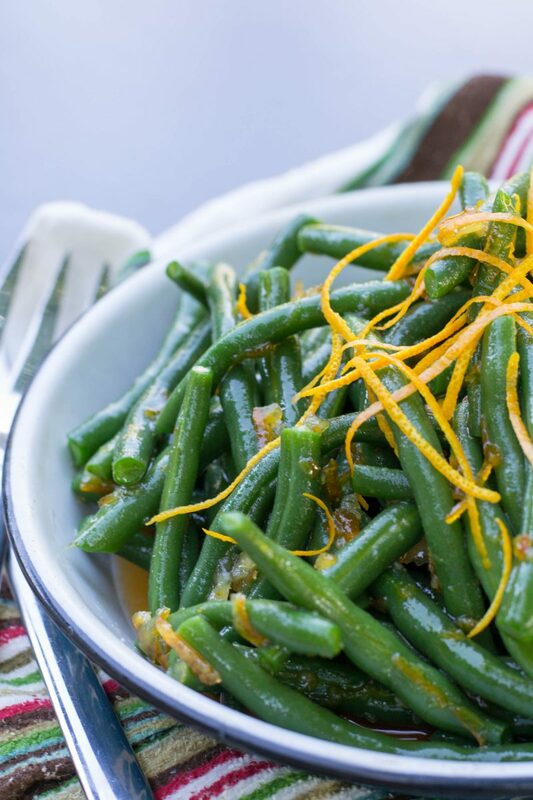 Have some green beans to use? 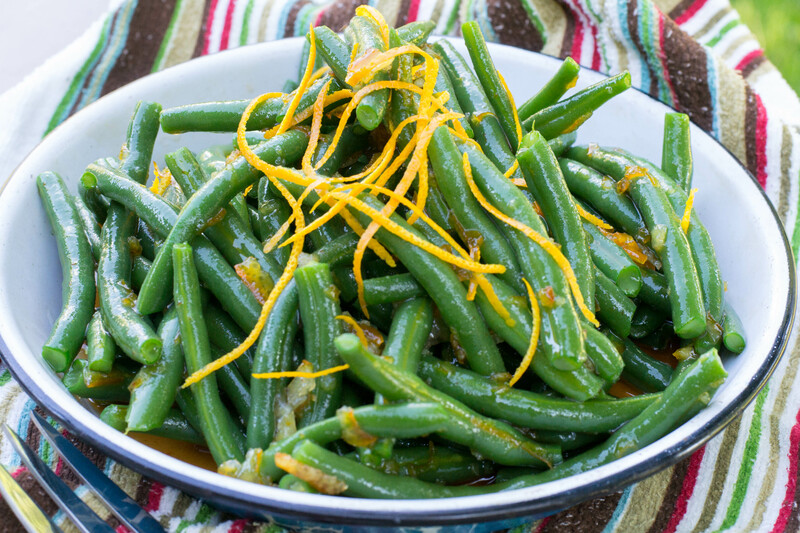 Try Sriracha Orange Glazed Green Beans. Blanch beans in boiling water to which you added 2 teaspoons of salt. Cook for 3-5 minutes, or until the green beans are just tender. Place cooked beans into a bowl of ice water to quick cool them. Drain and place in a large bowl. You can adjust the spice to your taste. 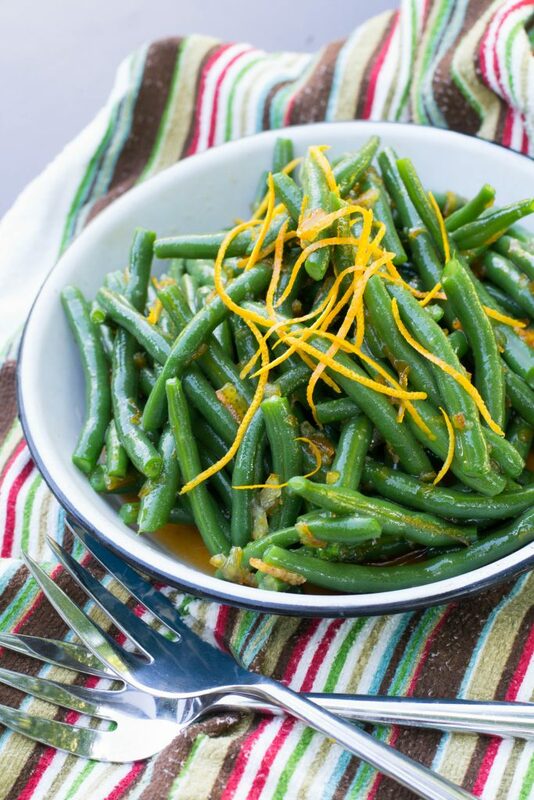 Add the orange sauce to the cooked green beans and toss to coat. Thick Italian minestrone is a combination of vegetables, pasta, beans, and tomatoes. Perfect for a snowy winter warm up. But, it’s summer….and, its hot. I really don’t want soup. 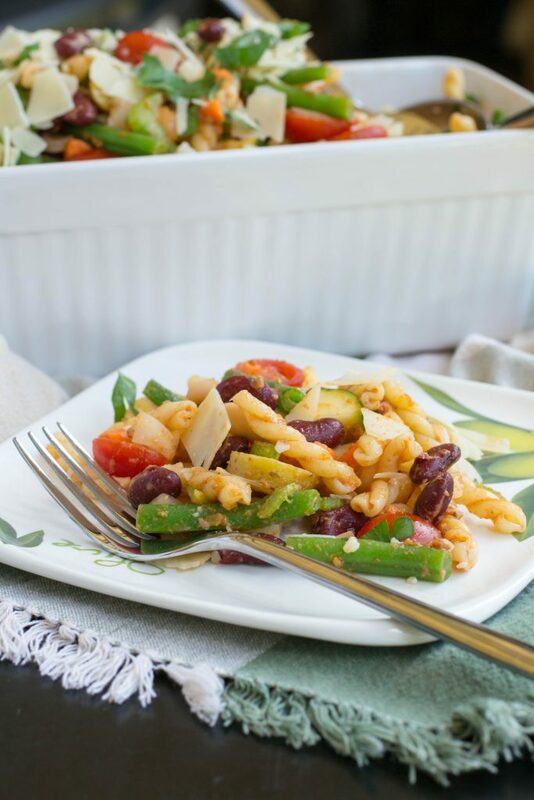 But the flavors of Minestrone sound really good…..lets try a salad!! Since there is no set recipe for minestrone…..according to Wikipedia. so add what you like. It’s usually made from in season vegetables. 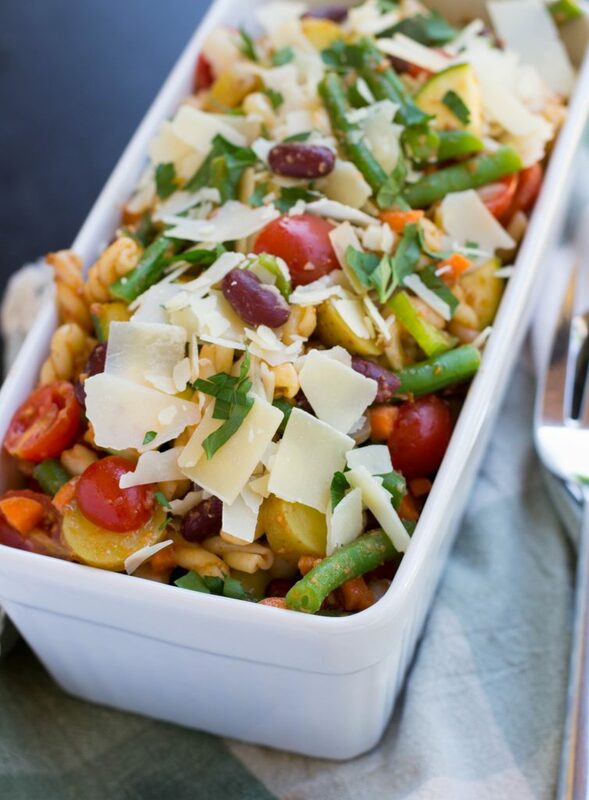 But, to be true minestrone according to cookbook author Angelo Pellegrini,minestrone must have beans. Well far be it from me to make an untrue minestrone, so we have beans. Two kinds…..dark red kidney, and white kidney or cannellini, as they are commonly referred too. 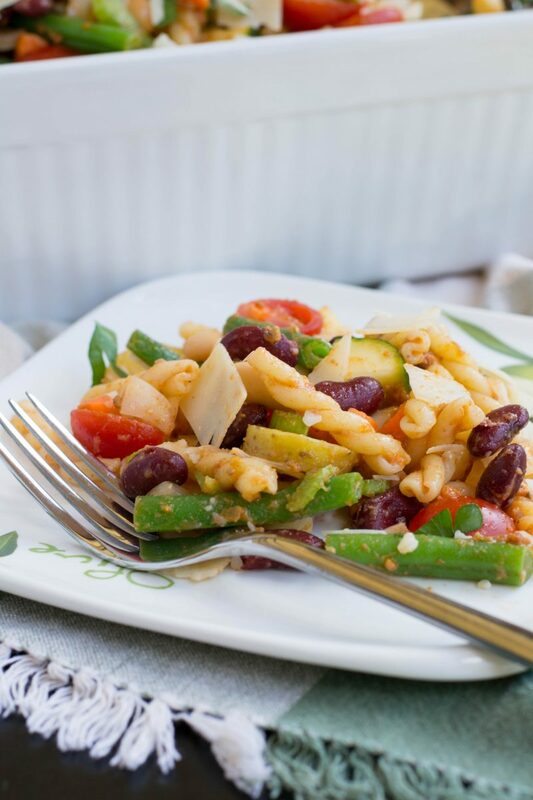 Fingerling potatoes, green beans, cherry tomatoes, zucchini, and carrot, celery, and onions, are added to al dente gemelli pasta and the beans. Any small pasta will do, I just like the twisted look of the gemelli. Instead of a “salad dressing” I used sundries tomato pesto. 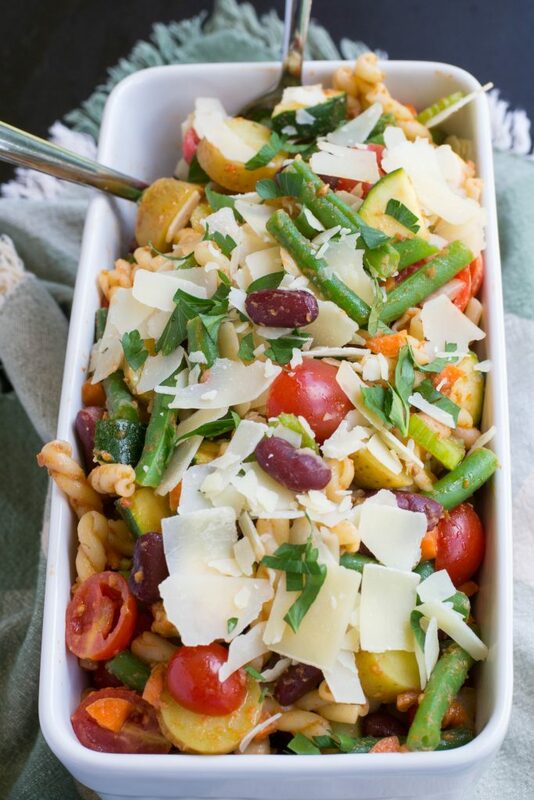 It has the right flavor for minestrone and it gives the Minestrone Salad the tomatoey look of the soup. 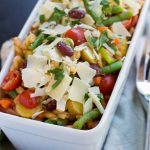 Minestrone Salad can be a main dish salad, served with a crusty loaf of bread, or as a side dish for your favorite meat. Slice fingerling potatoes in a medium saucepan and cover with cold water. Bring to a boil and cook until the potatoes are just tender, about 8-10 minutes. Rinse under cold water to cool. Set aside. Bring a pot of water to a boil and add 1 teaspoon salt. 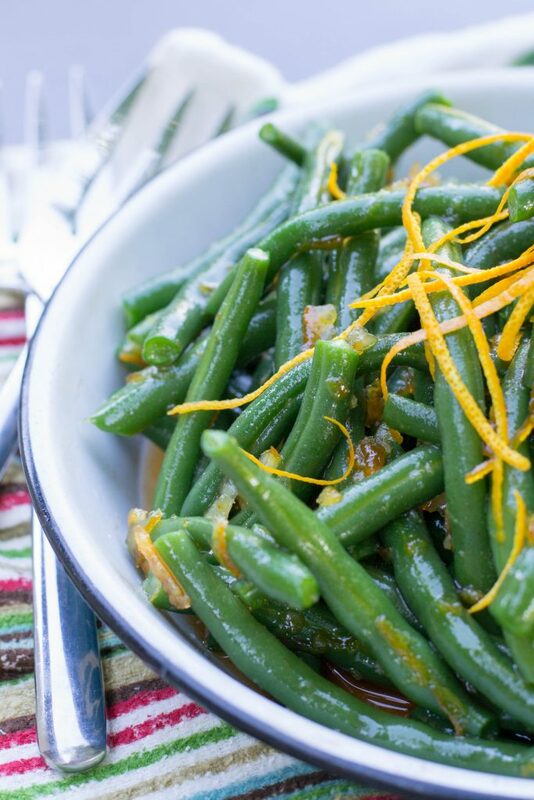 add green beans and blanch the vegetables just until they’re bright green, 1 to 2 minutes. Drain and rinse them with cold water, and set aside. Toss all ingredients until the pesto coats the veggies, pasta, and beans. Top with parmesan cheese and garnish with parsley if desired.